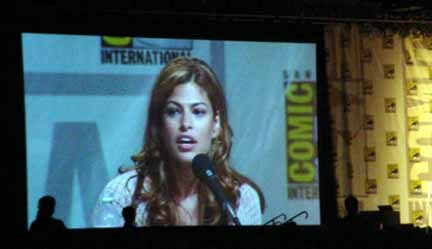 The Continuum continues its coverage of the Ghost Rider movie, following up a two-part interview with writer/director Mark Steven Johnson and actress Eva Mendes during Comic-Con International in San Diego with an edited transcription of the film's panel. For the panel rundown, in which Johnson discusses Ghost Rider's powers, the film's villain and much more, CLICK HERE. For part one of the roundtable interview with Johnson and Mendes, CLICK HERE. Look for more on Ghost Rider soon here in The Continuum. Michael Jai White, who starred in the Spawn live-action movie, is providing a voice for Spawn The Animation, McFarlane Productions has announced. In the animated film, White provides the voice of Barabas, the right-hand man to the villain Lukas. The character is 6-foot-6 and weighs 320 pounds. "It's all muscle," said director Chuck Patton. "He's a tank." White's previous animation credits include Doomsday in Justice League Unlimited and Osebo in Static Shock. As previously reported, Keith David is reprising his role of Spawn from the HBO series. Other voices announced by McFarlane Productions include Carl Weathers as Captain Edwards, Cree Summer as Marie, Bruce Boxleitner as Detective Ainge, Jon Polito as Sam and Mark Hamill as Twitch. SLG Publishing has released its solicitations for November. Arcana Studio has released its solicitations for November. * Upcoming episodes of Mutant X include "The Prophecy" the week of Sept. 5 and "Cirqe Des Marveilles" the week of Sept. 12. * Coming Monday: Movie news -- and much more. * For Monday, Aug. 15, including DC Comics' solicitations for November, CLICK HERE. * For Saturday, Aug. 13, including Teen Titans animated news, CLICK HERE. * For Friday, Aug. 12, including July's sales figures and second printings from DC Comics, CLICK HERE. * For Thursday, Aug. 11, including Dark Horse Comics' solicitations for November, CLICK HERE.